I am so excited for the fresh start of 2014, Happy New Year to all! To kick off the year, I've created a snowflake tutorial. I was inspired to make this particular project thanks to Pam at Gingerbread Snowflakes. Pam always has fresh and inspiring content and her warmth and personality shine through in her blog. She sent me a beautiful handmade holiday card this year and I instantly wanted to create something unique of my own. (I've been neglectful to family and friends - it's been a few years since I sent out any seasonal cards.) 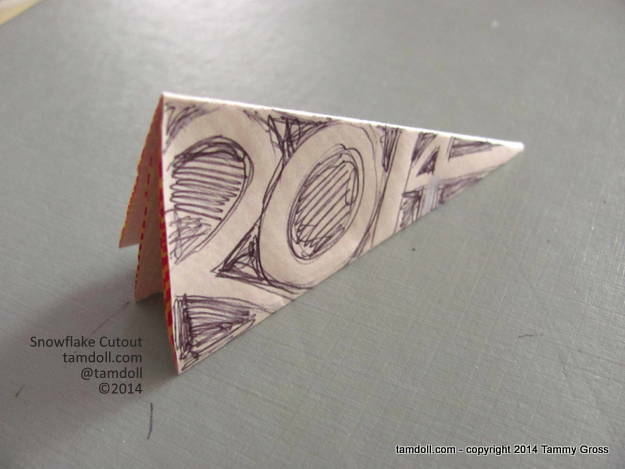 Being close to New Year's, I thought of creating one based on the date and a new project was born. 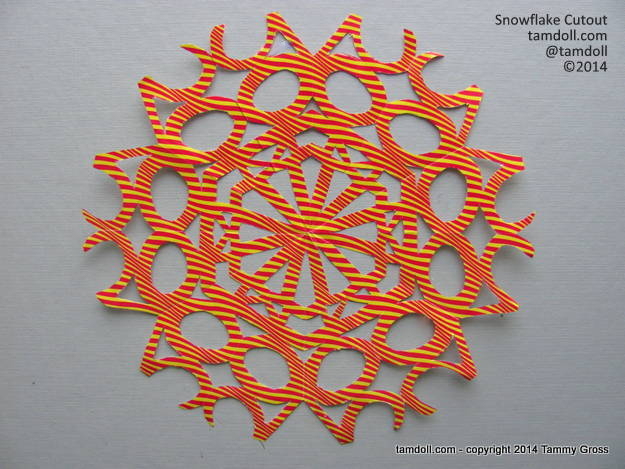 There is a full Snowflake Cutout Tutorial with more how-to images at https://tamdoll.blogspot.com/p/snowflake-cutout-tutorial.html. As I worked on it, I thought that it could also be appropriate for a milestone birthday or a graduation celebration. I haven't lost sight of creating a New Year's card out of it, but the large square shape leaves me with some more work to do until it's ready to be mailed. Of course, once the wheels started turning, more and more ideas developed - what if I used the snowflake as a stencil, or decided to embroider the pattern, or cut one out of felt and applique it? If I do nothing else this year, I already have ideas to keep me very busy! But that's not the case. I have many ideas. I've signed up for some online courses. I'm determined to focus this year. There may be only 5 of you reading these posts nowadays, but I'm happy you're still here. Thank you. That New Year's card? Will probably come out next December and I'll have to work on "2015". Thank you for visiting! And happy 2014! I love your snowflake. I used to make these cut outs a lot when i first started making bags. I sew them as applique on my bags. I often regret selling those bags as the applique was so intricate. And Happy 2014 to you. And wow! thank you for the mention and all your kind words. So glad to have a small part in your sharing this most excellent tutorial!